Applications: A really useful addition to angle grinders. 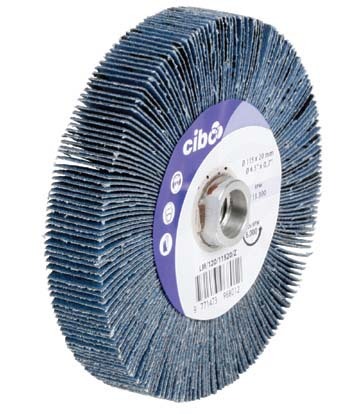 Enables rapid powered sanding of anything from stainless steel to hardwood. Clean welds, grain stainless components, remove rust, strip coatings, distress oak beams etc etc. M14 attachment fits most angle grinders of size 115mm upwards, as well as many metal finishing and polishing machines. M14 Fixing - fastens directly to most angle grinders and metal finishing machines. Zirconium abrasive cloth backed flaps suitable for all steels as well as wood.